If you have any recommendations let Helen know !! I love the hay from BM its lovely and only £3.49 for a large pack !!! They also sell timothy hay and other small animal treats. Small packs of Hay / shavings / Food. I find the hay a bit "strawy" but its good as a back up. 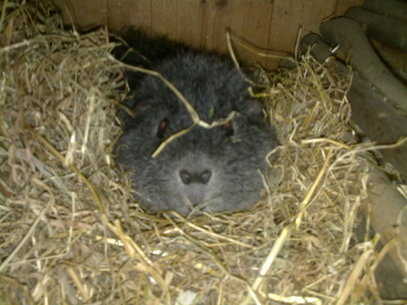 Guinea Pig cardboard tunnels - Great value £1.99, cheaper than large retail pet stores. Puppy pads £1.99 - Ideal for post op Guinea Pig care, and to inspect urine -if UTI suspected. Cat beds £4.99 lovely and cosy for winter snuggles.All my Guinea Pigs have these beds, i line with a puppy pad and lots of hay and just change at each cage clean. The Guinea Pigs do not eat the bed !! Jacob and Marley with their bed. Great pet section in this massive store just off City Road, Fenton. Much cheaper and better quality products than another large pet retailer.They do not sell animals. Hay - £3.49 compressed large bale.Really lovely hay.The rescue uses this. Shavings - £2.99 compressed bale,good quality.Not dusty. Health products - Good range including small animal mite drops by beaphar £4.69 worth keeping in / puppy pads. The Meadows Animal Supplies - Newchapel for baled meadow hay, shavings and food.Linda will order what you require. Jolleeys pet store Congleton -Full range good quality products. Penparc - Fenton - Full range pet products.They will order what you require. H.R Lea Oakes -Congleton, animal feeds supplier: Full range of small animal products/ prepacked meadow hay/shavings. Animal Zone - High Lane near Tunstall. Great range of products and the hay is fabulous ! !